My kids will tell you I'm slightly cardigan obsessed. Even though my job description of University Lecturer tends to evoke images of a uniform of smart blazers and tailored jackets, I'm more of a cardie kind of girl. I do admit to owning at least a dozen or so. However, I never can seem to find the particular one I am looking for. It may have something to do with the fact that the future doctor daughter has declared free rein on my wardrobe in her quest for appropriate clinical clothing and so she's usually got the one I want. And for some reason very few of my current crop of cardigans are lovingly hand knitted. So here are the fruits of my wardrobe planning for next autumn / winter. I'll have time to make three of four by then. 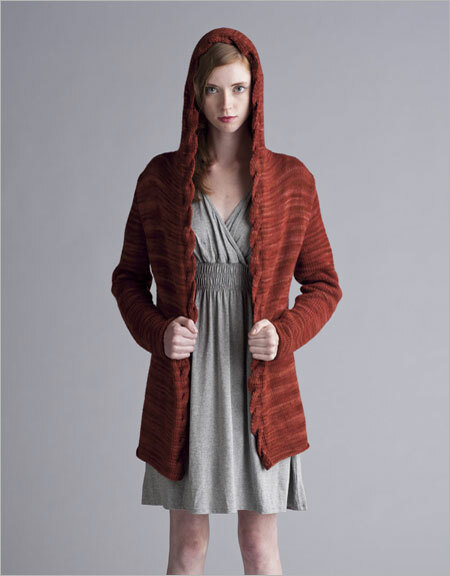 Levenwick: An asymmetrical cardigan by Gundrun Johnson. I love the wavy front band and it has pockets! (and the colour - trouble is I'm having fun finding affordable wool in this colour). French Braid Cardigan By Tanis Fibre Arts. Not really my colour but I'm looking forward to knitting the curvy cables. I'm envisaging a rich rusty brown. Blumchen by Anne Hanson of Knitspot. Lacy, tailored and classy. Saturn Sweater by Linda Permann from Interweave Crochet Fall 2012. This one is crocheted and it's all about the colours. The middle daughter is in deep planning mode for a trip to Europe at the end of 2013 so she's going to be headed into deep winter. It seems like a good excuse to have to make more winter accessories. Scalloped Ruff by Pam Powers. This is just some feminine and girly. There's both a scarf and a cowl version. The BFF Cowl from Knitty Deep Fall 2012. Knit two and share with your best knitting friend. In this case, a matching set for my daughter and the friend she is travelling with. Birdwing by Steven West of WestKnits. An interesting architectural knit made in five pieces. Knit in the right colours (a golden ochre and rusty brown) I'm thinking this is my new football scarf. After all, I barrack for the Hawks! I think that is enough knitting to keep me occupied till next winter!